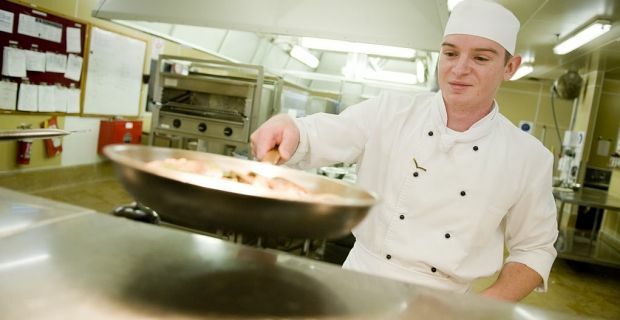 Whether you want to pursue this career because you’d like to be the next celebrity chef like Jamie Oliver or if you’re ambitions are a little more realistic, we’ll tell you what to study to become a chef in the UK. Most careers as a chef begin with a job as a trainee. In order to get this type of job you’ll need to be qualified. A good standard of general education is required, and it’s possible that qualifications in hospitality and catering will put you ahead of your rivals but they’re not the professional qualifications that will be needed to push you through the ranks. A part time or full time college course in Professional Cookery, Professional Patisserie and Confectionery or a Certificate in Hospitality and Catering Principles are needed if you want to achieve your goal of becoming a chef. These courses not only show that you have the knowledge necessary to work in this industry, they also prove that you have the experience needed to get your foot in the door as they offer classroom study and practical experience. This is another way into the industry. You could be carrying out your apprenticeship while studying at a training centre or college. If you do that, you should expect to spend between two and four years as an apprentice. During that time you’ll learn the ropes and work side-by-side with experienced and fully qualified chefs so this is an ideal learning environment for a young and keen cook. Assuming that you have a keen interest in cooking, strong communication skills and the ability to work under pressure, you should be able to make a go of a career as a chef. If you’d like more information on the job role, why not head to nationalcareersservice.direct.gov.uk?